A new experimental-computational method for designing the catalytic converters for gases purification contaminated with hydrocarbons based on researched mechanism of heterogeneous catalytic process which stages are described by mathematical models is developed. 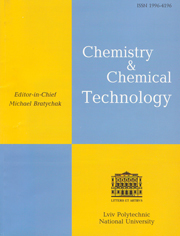 Ertl G., Knötzinger H. and Weitkamp J.: Handbook of Heterogeneous Catalysis. Weinheim, New York 1997. Levenspiel O.: Chemical Reaction Engineering. Wiley, New York 1999. Engel T., Ertl G., King D. and Woodruff D.: The Chemical Physics of Solid Surfaces and Heterogeneous Catalysis, v. 4. Elsevier, Amsterdam 1982. Tovazhnyanskiy L., Krasnokutskiy Ye. and Ved' V.: XXV Mezhdunar. Nauchn. Konf. Matematicheskiye Metody v Tekhnike i Tekhnologiyakh, Russia, Saratov 2012, 135. Ioffe I. and Pismen L.: Inzhenernaya Khimiya Heterogennogo Kataliza. Khimiya, Leningrad 1972. Beskov V. and Flokk V.: Modelirovaniye Kataliticheskikh Processov i Reaktorov. Khimiya, Moskwa 1991. Solovyev G., Klimash A. and Goncharov V.: Energotekhn. i Resursosberezh., 2008, 5, 44. Thomas J. and Thomas W.: Principles and Practice of Heterogeneous Catalysis. Weinheim, New York 1997. Krasnokutskiy Ye., Ved' V., Ponomarenko A. and Koshchiy V.: Intehrovani Tekhn. ta Enerhozberezhennya, 2013, 2, 126. Rouquerol F., Rouquerol J. and Sing K.: Adsorption by Powders and Porous Solids. Academic Press, London 1999.